Five months after suffering a massive stroke, Ted Gray’s fingers move gingerly across the keyboard. He smiles as the notes of a hymn fill the air. “It makes me feel closer to God,” Ted, an organist for Manawa Faith Community Church in Council Bluffs, Iowa, said. Last summer, it was doubtful the music lover would ever play again. On June 2, 2018, Ted fell, severely damaging his spinal cord. To add insult to injury, the trauma tore his carotid artery. A blood clot traveled through Ted's bloodstream to his brain, causing a debilitating stroke. Surgeons at Nebraska Medicine in Omaha worked to repair the damage. The outgoing Iowan couldn’t walk, eat, or communicate normally. Needing extensive rehabilitation, Ted and his wife, Meredith, selected Madonna’s Lincoln Campus as the next step in his recovery. Ted drew strength from Meredith, and children Scott, 11, and Grace, 8, who stayed in on-site housing. Faith and family support were pivotal to Ted’s progress. “It was invaluable that we got to spend the summer here, the kids right by their daddy,” Meredith said. His Specialty Hospital team devised goals to return the 57-year-old to his life roles while applauding each small accomplishment, like sitting up or forming a sentence. “They were there when even the simplest things were so hard,” Ted said. Transitioning to the Rehabilitation Hospital, Ted blossomed, bonding with everyone from nursing and therapy staff to the dietary crew, appreciating their expertise and encouragement. Repetitive training on the Lokomat, robotic-assisted gait technology, boosted the muscle memory in Ted’s legs. Reading books out loud revived his voice inflection, affected by the stroke. Jessica Virgil, OT, recognized Ted’s love of music, suggesting he accompany Madonna’s congregation during a chapel worship service. After weeks of practice, Ted, using his dominant hand, played gracefully as his heart soared. “He sounded beautiful and brought tears to my eyes,” Virgil recalled. Within three months post-stroke, Ted transferred to Quality Living, Inc., a post-acute rehabilitation center. “Nebraska Medicine saved my life, Madonna rebuilt my life and QLI added the finishing touches,” Ted said. He proudly walks short distances with a cane and is close to graduating from his wheelchair. 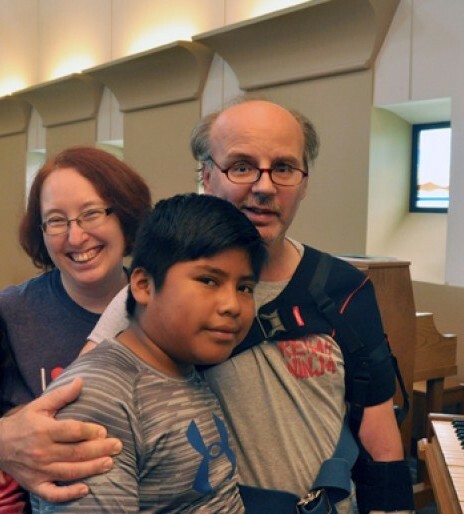 Ted is progressing in the Omaha Campus outpatient program, TherapyPlus, with goals of returning to his organist duties and volunteer outreach work. “I'm so glad to be alive!” Ted said. That’s music to our ears. Learn more about Madonna's unique approach to stroke rehabilitation.